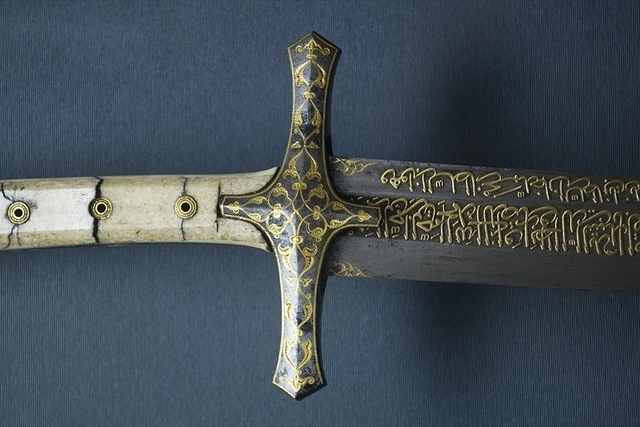 Forum Index > Historical Arms Talk > Info about Mehmed II Saber in Topkapi? 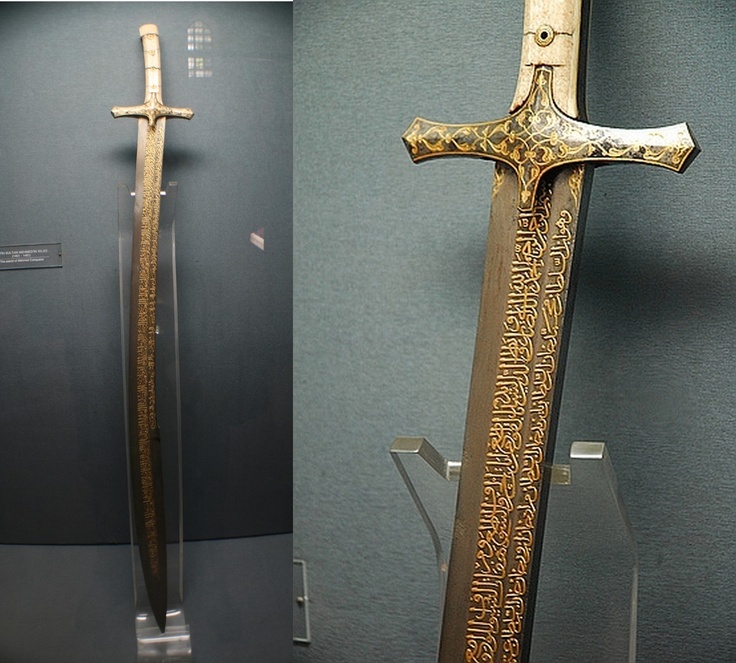 Posted: Wed 11 Jan, 2017 6:11 pm Post subject: Info about Mehmed II Saber in Topkapi? In the name of Allah, the most Merciful, the most Beneficient. Praise be to Allah Almighty who blesseth religious faith with lustrous & lucid verses and sharp & shining swords. Salat and salam upon our noble Prophet Muhammad and his household who are attributed with the most exquisite, lucent words. Bless and strengthen Mehmed II, son of Murad II, the poignant sword that is drawn in the name of Jihad; the Sultan of ghazis and mujahideen that striveth to glorify the holy men of Allah; may the necks of the enemies of Shariah becometh the scabbard of his sword; shed your grace on the ink of his pen. What could those grip panels be made of? Ivory, or perhaps bone? Any information whatsoever about its style, craftsmanship, materials, dimensions, inscription meaning, or history would be invaluable. 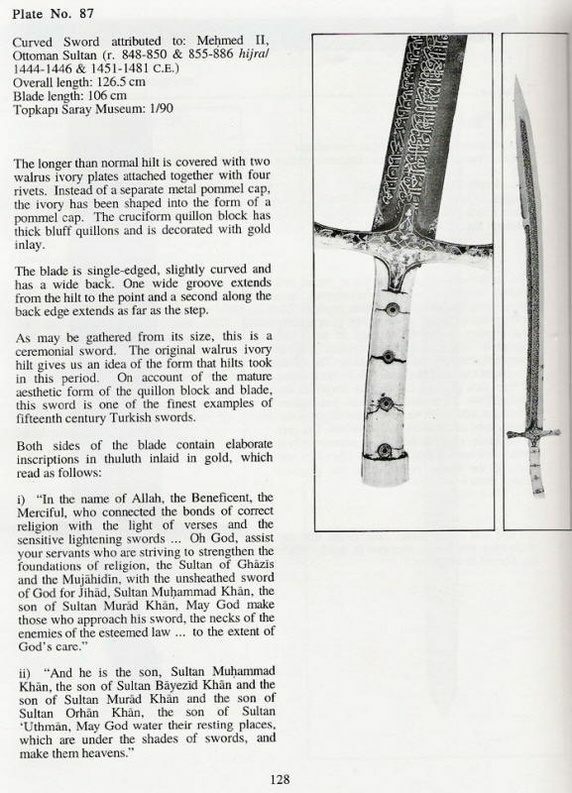 UPDATE: I finally found a picture that I presume to be from Islamic Swords and Swordsmiths by Ünsal Yücel, is that correct? Is this probably the best catalog entry I'm likely to find?